Keen and I were fortunate enough to get review codes for Divinity: Original Sin and have spent the past week playing the game’s drop-in/drop-out co-op. You don’t often see a lot of RPGs these days that are memorable or even that good, especially when everything is being dumbed-down and streamlined, so it is very surprising and exciting when gems like D: OS pop up. We’re still working through the game so we aren’t going to do a full review just yet, but we decided to share some of the very awesome aspects about Divinity: Original Sin in the mean time. We found a bucket, a hammer, and a pot and made helmets. Divinity: Original Sin can be played fully cooperative either over LAN or Online. You are already given two characters to play with so when somebody joins they take over the other character. Another interesting idea that they use is cooperative conversations. Every now and then you will get to interact between your characters and each person can take a different stance on something. If you can’t resolve it one way or another then each character will use their persuasion skill in a game of Rock-Paper-Scissors to see who wins out. Either way each character will gain points in different personality categories that will give bonuses to different abilities. 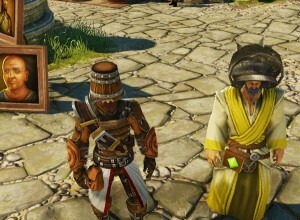 I absolutely LOVE turn-based combat and that is exactly what you get with Divinity: OS. As soon as you are detected by an enemy or take a hostile action then everything switches from real-time to turn-based. What’s actually really interesting is that if other party members are off doing other things then they will remain in real-time while the combat goes on. Once they get close enough they join in on the combat. I love it when spells interact with each other and D: OS is full of that stuff. Many spells are able to create different surface effects like oil, water, fire, and poison. Other spells can then interact with those surfaces and make interesting things happen like lighting oil on fire, freezing water, putting out fires, or igniting poison. Not only that but many of the spells in the game also create cloud effects like smoke, steam, and poison gas. Some clouds can be electrified and others blown up or used to disrupt line of sight. I haven’t even delved very far into the depths of the game’s crafting system but I find it fascinating. There are tons of different resources and ingredients you can find scattered about and you are able to combine them together in interesting ways. For instance, you can find branches and use a knife to carve them into arrow shafts and then attach them to arrowheads. Or combine two branches together to make a staff. Or you can take a wooden doll, combine it with a needle and then some pixie dust to make a voodoo doll that can damage a target. Sometimes you will find different recipes by reading books but it’s also a lot of fun just trying to combine different objects together. Near the very beginning of the game I was messing around and used a hammer weapon on a tomato, which made tomato sauce. Then I used flour and water to make dough and then added in the tomato sauce to make pizza dough, which when cooked at a fire source makes the pizza. It’s just cool stuff like that that you happen upon that makes the crafting so fascinating. Keep an eye out for our full review of Divinity: Original Sin. Hopefully we will be able to get it up before the end of this week at the latest. I picked it up during the Steam sale and have been enjoying it immensely. I can only hope it is as large in scope as Skyrim so I can continue to enjoy it for some time. I also started 2 days ago and this game is awesome! It is a total throwback to Baldurs gate days, and it builds a lot upon that with Crafting.For years I have been searching for something like this, even though I gravitate more towards the pause mechanic than the turn based mechanic(as it can be tedious at times) it is still one of the best True party based RPG’s I have played in years. Truly well done on this masterpiece! How does the game compare to Blackguard, if you played that? I played blackguard, it was decent, but this has much more depth, also this doesn’t use a grid of tiles to move around, and it saves Action points when you don’t use them for the next round, there is no ‘mana’, all spells use action points.The world is VAST in comparison, not just small set maps.Its one massive map per zone. Character development is also much more in depth. On my side, I’m struggling with the multiplayer aspect. I’m the second player and it can be frustrating at times. Unless we missed the option, the companions cannot be controlled by the second player, so my buddy ends up controlling 3 toons while I only have one. Dialog aren’t always showing up properly for the other player either. The game looks great and the story so far is interesting, but it probably needs some time to polish certain aspects. @Mal You can assign who controls what character. I think it’s the first option when you hit escape. As for the dialogues, I’m pretty sure the only person who gets to see the conversation is the person who is in it. The only time the other player gets a dialogue window is if they are close enough and a co-op dialogue option happens. You can still read what is said in the chat window but it’s not ideal, especially when other NPCs spam you. And Keen and I restarted at least four times so I feel ya there. Broke down and got this yesterday, for years I’ve been a casual D & D tabletop player. As life happens, other members move away or get new jobs. We’ve been looking for a turn based online game to fill in the void. Hopefully this fits the bill! @Graev, I’ll try that. I saw the button last night too when I started a solo game to try sub-optimal characters as my friend would say.